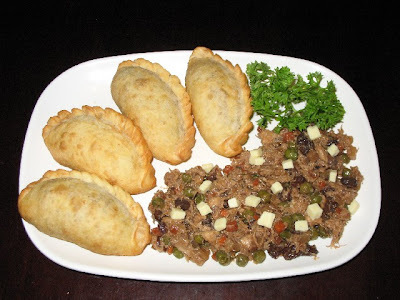 It's been weeks since my friend Rogelyn's birthday bash at the office ~ same time I promised to post her very special empanada recipe, as well. The delay was caused by too much work but don't worry, here's the recipe. Now I haven't tried this one yet, but over the weekend I plan to. Why don't you and I try it at the same time and compare notes, huh? 2. Add cubed carrots, potatoes, and the green peas. Mix well. 3. Shred the chicken breasts into small pieces and add to the mixed vegetables. 4. Season with oyster sauce. 5. Add raisins and cubed cheddar cheese. 1. Mix the flour, white sugar,and baking powder in a bowl. 2. Beat the eggs and add the water and melted butter. 3. Knead until dough is smooth and satiny. 4. Cut into 20 equal portions. 5. Roll out dough into perfect (if possible) rounds, about 3.5 - 4 inches in diameter each. 6. Place a generous amount of filling in the center. Fold in half, forming a half-moon. 7. Crimp around the edge of the empanada. 8. Fry in deep hot oil. Be sure to drain out excess fat!